Support us by spending a lovely evening with great tunes! 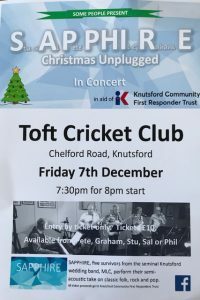 Our Chairman Sal Thompson and her band SAPPHIRE are performing at Toft Criticket Club on 7th December, all proceeds go to the Knutford First Responders. Come down, enjoy a few drinks and some great acoustic tunes. £10. Contact us here for tickets.